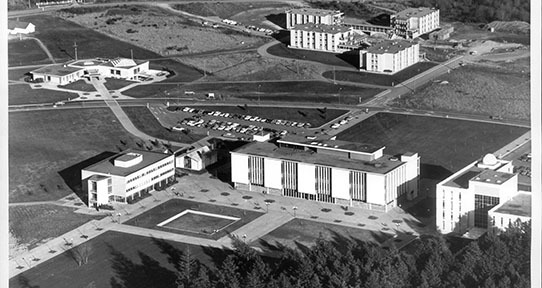 Victoria-born sculptor George Norris left his mark on local cityscapes including the University of Victoria campus. 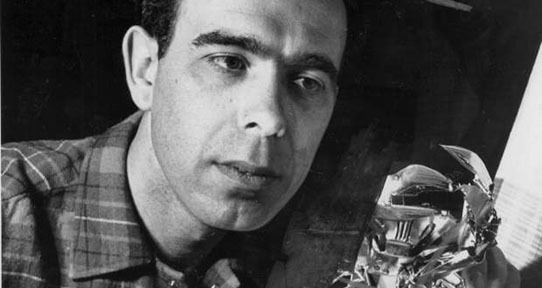 Norris was educated at the Vancouver School of Art (now Emily Carr University of Art + Design), Syracuse University, and the Slade School of Fine Art in London (after receiving a British Council scholarship in 1955). Norris was a skilled sculptor in various media, including plaster, bronze, granite, and brick. One of his best-known works is a stainless-steel crab outside of the H.R. MacMillan Space Centre in Vancouver (1968). 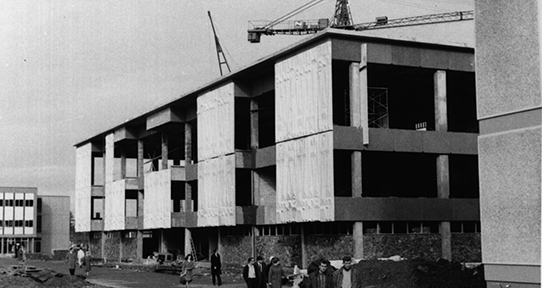 Norris’ most familiar work on the UVic campus is the pre-cast panels that adorn the building’s façade. These bas-relief (shallow sculpture) abstract panels are most prominent on the front of the library, but can also be found on the attic storey and at the back of the building. 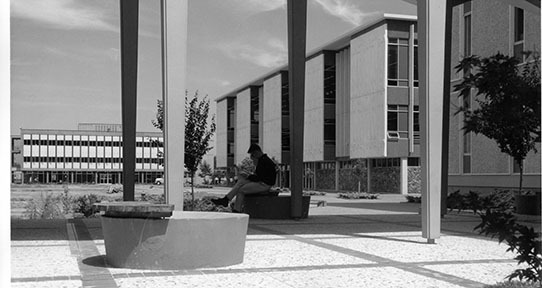 A proponent of artist and architect collaboration, Norris advocated for the importance of integrating public art into the form and function of a building. He also frequently left works untitled so viewers could interpret his work for themselves, as is the case with the panels. 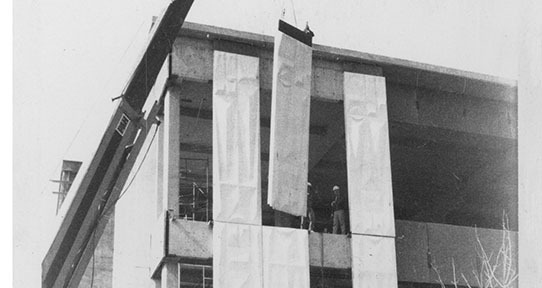 The UVic Libraries' canvas bags and community cards rightfully bring these panels into focus, as they are symbols of UVic’s architectural history and the library itself. 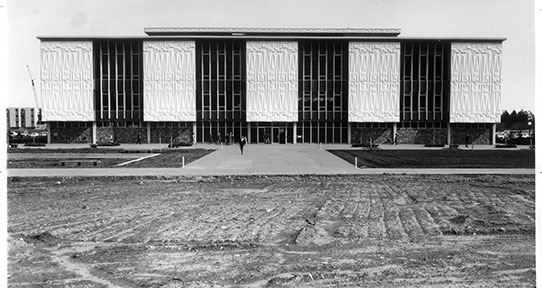 The McPherson Library opened in November of 1964 after 16 months of construction. The architectural planning for this initial stage was undertaken by R.W. 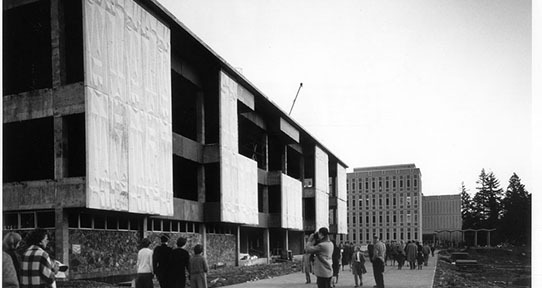 Siddall and Associates and features reinforced concrete, stone aggregate, and rough granite on its four storeys in addition to the pre-cast concrete panels. 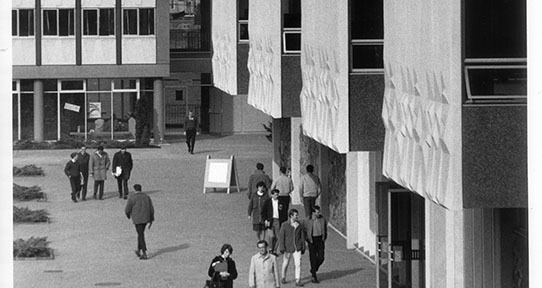 From its earliest stages, the University of Victoria campus plan emphasized the vital role of public art on campus. The McPherson Library—a monumental structure anchoring the east end of the quad—is most recognizable by its sculpted façade, and stands as a testament to the enlivening abilities of public art. George Norris’ abstract panels assert the library’s central role on campus and within the academic community. In 1974, Siddall Dennis Warner undertook a major addition. The addition doubled the size of the library, and replica George Norris panels were added to the exterior to retain consistency in the design.